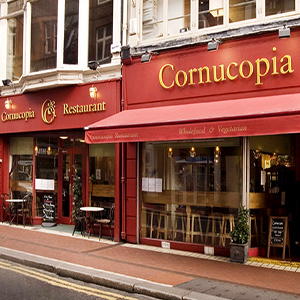 It is the much loved and long established Cornucopia wholefood and vegetarian restaurant on centrally located Dublin City Centre's Wicklow Street. 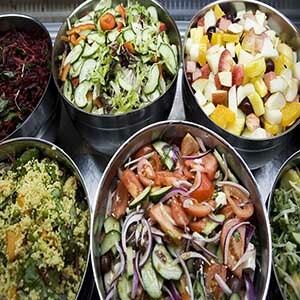 We are the popular & renowned award-winning wholefood vegetarian restaurant on Wicklow Street, Dublin since 1986. Our casual dining restaurant is open seven days a week. We are passionate about good quality, tasty and home-produced food and are committed to bringing the best quality and freshest vegetarian, vegan and wholefood cuisine. We produce a varied menu of delicious inventive food which changes daily and is prepared in-house. Each day, our team of talented and hard-working chefs prepare our delicious array of breakfasts, soups, salads, main courses, juices, breads, desserts, cakes and snacks. Our fresh, tasty food has an emphasis on locally grown and organic produce. Our small, but expertly chosen organic wine list has something for every pallet. We are the go-to guys when it comes to healthy feel-good food in Dublin city centre. Our menu offers original and well-though-out choices for a wide array of special dietary requirements; vegan, dairy-free, coeliac, gluten-free, yeast-free, sugar-free, and raw/living. If time is an issue, no worries, you can rest assured that all our food is available for take away! We are housed within a beautiful Georgian Building with plans to expand to upper floors for further dining, music and arts events. Our recently renovated and artistically decorated ground floor and 1st floor dining areas provide a warm, friendly and welcoming atmosphere. Our hard working staff are dedicated to bringing you, our customer, a positive experience while visiting us. As well as welcoming walk-ins, it is possible to make a booking for groups, please get in touch by email or phone. On Thursday, Friday and Saturday evenings from 7.30 - 9.30 we have live instrumental harp and guitar music. Keep an eye on our website and social media pages for further information on exciting gigs, talks, workshops and events. If you are hosting an event and would like to know more about our catering service, please give us a call and we would be delighted to talk you through our choices of soups, salads, stews, bakes, breads, cakes, desserts and finger food. Opening each day from 8.30am, Monday - Saturday, we delight in looking after your health and well-being, serving vegetarian breakfasts, ranging from fruit salad & granola to our renowned homemade baked beans & hash browns. Frequently being listed as a top spot for breakfast, our handmade sausages have become stuff of legend in our fair city. From midday until 10pm, Monday - Sunday our wide selection of dishes satisfies every palate. Each day we have two hot soups, two raw soups, ten salads, six mains, wraps, hummus & paté plates accompanied by a selection of breads, cakes & desserts, both scrumptious and wholesome. Join us for a meal, a snack or simply a fresh juice, delicious coffee or glass of organic wine. Our friendly staff will be delighted to welcome you! Our award winning cookbook "Cornucopia At Home" won the inaugural award at Listowel Foodbook of the Year 2010, and is now in it's ??? printing. Published in 2008 Cornucopia at Home is a colourful collection of popular recipes from Cornucopia's history. It is for anyone with a love for fresh and healthy feel-good home cooking. They can take their pick from a tempting array of hearty soups, delicious salads, imaginative main courses, crusty breads and sumptuous desserts. Including options for vegans, coeliacs and those on a variety of special diets, these beautifully illustrated, informative and easy to master recipes will bring joy and satisfaction to every table they reach. A healthy lifestyle involves eating nutritious food, drinking lots of clean water, taking regular exercise, and assisting ourselves through our modern life with some form of relaxation or meditation technique. Eating at Cornucopia can be or become part of your healthy lifestyle. You can eat-in or take the food home with you. Our food is packed with nutrients and made from the very best of fresh ingredients. We encourage everyone to cook and prepare meals at home, and to move away largely from processed foods. However, eating at Cornucopia and/or taking our food home with you can be convenient and economical, when life is busy and when convenience is a priority. Our meals are nutritionally balanced, and we use a large volume of extra nutritious ingredients such as our sprouted beans and lentils, our soaked barley, our freshly pressed juices and wheatgrass, our large component of fresh herbs and young greens, and our high quality olive oil and olives imported directly from Italy. These foods in particular are packed with antioxidants, healthy fats (for your brain) with lots of omega 3's and 6's, and enzymes, vitamins and trace minerals to give your body and immune system that extra charge and protection. In season a quantity of our fruits and vegetables come from nearby Wicklow and are grown on the organic farms of Marc Michel in Kilpedder and Goldriver in Aughrim. These products come, spray free, straight from their healthy soil, to your plate. All of our grains and pastas are also organic giving our breads, cakes and pasta dishes that extra dimension of flavour and nutrition. In addition, all of these products are handmade for you on a daily basis by our pastry, main course and salad chefs. Practically none of our food is made off site so that there is only a very short travel time for the prepared food - just the few yards or meters from the chefs' bench or oven across the counter to your table or take-away container. This short time preserves the nutrients and freshness and makes our meals truly homemade in Cornucopia - a home away from home for many customers!